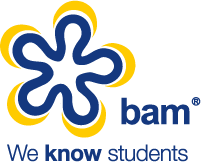 Working in partnership with Lycamobile, BAM conducted a strategic whiteboard session with key Lyca personnel at BAM HQ. The session was designed to hone Lycamobile’s proposition and appeal to students, whilst identifying potential channels aimed at maximising reach. It was important for Lycamobile to create ‘quality engagements’, educating a mass student audience face-to-face fast. The competition for mobile services is rife within the student sector, consequently it was crucial to target students before and during the start of the university term in order to gain traction. University Freshers’ Fairs were identified as a key channel to get Lycamobile face-to-face in front of a mass student audience quickly. Together we identified and targeted strategic universities with high student numbers in order to focus the budget and maximise our ‘bang for the buck’. BAM planned and booked the entire campaign. Using our strong relationships with universities and Student’s Unions across the UK we were able to plan and book attendance at over 50 university Freshers’ Fairs and events cost-effectively and hassle-free.